Please post all Suncoast & FYE related deals, questions and issues in this thread. I ordered the Geneon's last complete set of Vandread 1&2 from SecondSpin.com but instead I received a 3-disc bootleg copy made by "FX" I contacted them about this. I already own the first Funimation edition, but I wanted to track down the Pioneer/Geneon release because the video is encoded better. And after that I'd have bought the Ultimate Collection to own the 2-part OVA version too. It's the first time something like this happens to me. Last edited by ComSR; 07-18-2011, 09:24 AM. Sorry to hear about that ComSR. I have been pretty satisfied doing business with SecondSpin until recently. I got an e-mail from them saying that all the DVDs I just sold to them were rejected because they were "Non Consumer Goods". They were all legit R1 releases, so it irritates me to see that they somehow got a hold of a bootleg. Still debating on whether or not to contact them on it. I wasn't going to get much credit and frankly, I'm glad to be rid of the DVDs. Your situation plus my own is making me think twice about continuing to do business with them. Since I'm an international customer, the situation might be in my favor. So far, whenever there's been a problem, they've either sent a free replacement or store credit for the full amount of the order. Didn't need to send anything back. Though their customer service seems to get easily confused by things if you don't keep your message short and simple. I have seen bootleg used copies of anime at my local FYE/Suncoast in the past. I have heard of bootleg used copies via SecondSpin.com and Wherehouse.com from other forums. I guess sometimes stuff just get slipped past by. Can't make it to Comic Con? Points to the thread title...Suncoast, FYE. Check your local store to see if they are participating. I see. I thought there were three stores in the thread title... my bad now that I did some research, although secondspin is different, right? SecondSpin.com and also Wherehouse.com (not in the thread title) are also part of Trans World Entertainment. 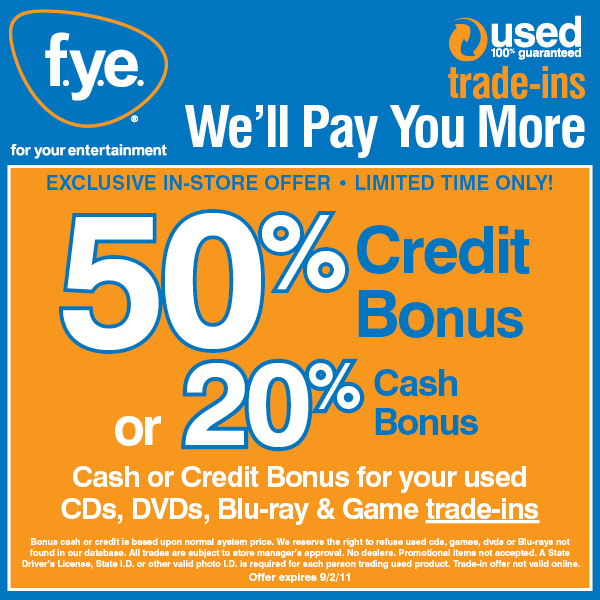 FYE and Suncoast are the B&M stores. Ah, thanks WTK . Didn't know. If the last Suncoast in this section of the state hadn't closed five years ago... oh, well. They probably wouldn't have had crap on the shelves, anyways. Yeah, I live in a major metropolitan area and have no FYE/Sun Coast. We don't even have a Hastings here unless I want to drive over an hour to get to one. It's weird that surrounding smaller towns have FYE, etc but not in Fort Worth or Dallas. Oh well. Exclusive in-store offer - Limited time only!